How did life on Earth begin? AVL helps to answer this question in Life: A Cosmic Story, which premieres November 6, 2010 at the Morrison Planetarium in San Francisco.For the all-digital production produced by the California Academy of Sciences, AVL visualized a seamless journey into the Milky Way galaxy to see the early stages of our solar system before the earth was formed, 5 billion years ago. Viewers fly though lanes of gas and dust into a turbulent molecular cloud where our newly formed sun is accreting a protoplanetary disk prior to the formation of the planets. The AVL team integrated scientific simulations and observed data sets to create the two-minute voyage. 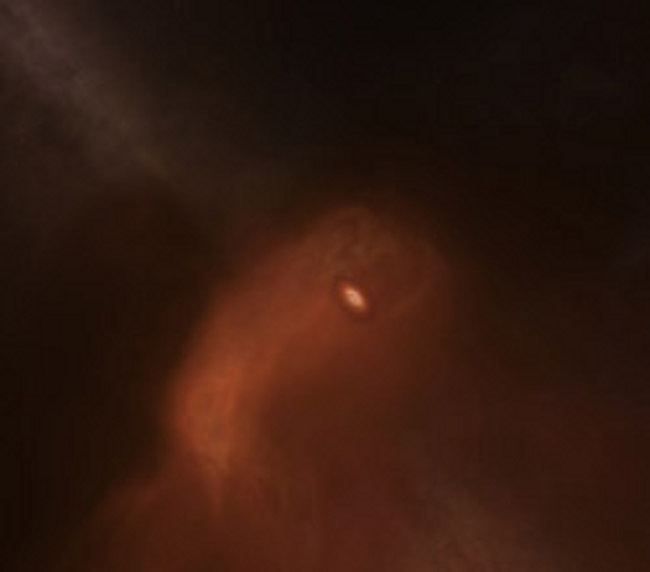 They visualized the protoplanetary disk from data computed by Aaron Boley, Sagan Fellow at the University of Florida, using AVL's data visualization plug-in for Maya. The disk was embedded in a turbulent molecular cloud, simulated by Alexei Kritsuk and Michael Norman from the Center for Astrophysics and Space Sciences, University of California at San Diego. Their adaptive mesh refinement simulation was rendered using AVL's custom Amore volume renderer. AVL used their ultra-high-resolution 3D display and Virtual Director™ software to design the multi-scale flight path in real-time, while pre-visualizing the scene with their interactive Partiview Software. The Milky Way galaxy, molecular cloud, protoplanetary disk and our sun were each rendered separately in high-dynamic range using different visualization techniques for each layer and composited to create the final dome imagery. AVL staff involved in the Life project were Cox (producer), Robert Patterson (visualization designer), Stuart Levy (visualization programmer), Alex Betts (visualization programmer), Matthew Hall (visualization programmer), and AJ Christensen (visualization programmer). Narrated by two-time Academy Award winner Jodie Foster, Life begins in a grove of towering redwoods, majestic emblems of Northern California. From there, the audience "shrinks" dramatically as it enters a single redwood leaf and then a redwood cell, learning that redwoods are composed of the same basic molecules as all other organisms on Earth. Then the audience witnesses key events since the Big Bang, including the sequence created by AVL: the first stars ignite, galaxies coalesce, and entire worlds take shape. On the early Earth, two scenarios for the dawn of life are presented—one near a turbulent, deep-sea hydrothermal vent, and the other in a primordial "hot puddle" on a volcanic island. From these microscopic beginnings, life transformed the entire Earth as it evolved and diversified: filling the atmosphere with oxygen, turning the continents green, and altering global climate patterns. The 25-minute show ends with a review of geological evidence and the connectedness of all living things on Earth. Life: A Cosmic Story will play seven to 10 times every day in Morrison Planetarium through late 2011. Content advisers included scientists from the Academy, NASA Astrobiology Institute, SETI Institute, and University of California, Santa Cruz.